Rods and Cones are the photoreceptors, useful in providing vision to the eyes. Rods provide vision during dim light or night also known as scotopic vision, whereas cones provide vision during day time or at bright light also known as photopic vision. Secondly, rods do not support the colour vision, but cones are capable of colour vision, with high spatial acuity — the level of the light where both the types of work, is called a mesopic vision. Eyes are one of the primary sense organs found in the human being and other animals. The role of the eyes is to visualize the object coming in front of us. But the core work is done by the photoreceptors, which are found in the retina of an eye. There are around 125 million photoreceptors present in the human eye, and these cells work by absorbing light and further converting into signals, which triggers the membrane potential and result in visual phototransduction or supporting the vision in the light. There are various factors like sensitivity, function, deficiency disease, etc. to differentiate the rods and cones, with this article we will focus on such points and the brief description of them. Meaning Rods are one of the photoreceptors found in the eye, these have rod-like structure and provides twilight vision. Cones are also photoreceptors present in the eye, they are fewer in number and are of the cone shape. Rods are usually located around the boundary of the retina. Cones are usually located in the center of the retina. Rods are about 120 million photoreceptors out of the total 125 million photoreceptors in the human eye. Cones are 5 million photoreceptors. The shape of the outer segment/Pigment The outer segment is cylindrical of Rods which contain rhodopsin pigment, made up of Vitamin A. The outer segment is conical of Cones which contain iodopsin pigment. Rods cells do not give colour vision, and they do not have any differentiation. Cones give colour vision, and they are of three types: green, blue, and red. Lack of the pigment in the rods, known as rhodopsin may cause night blindness. Lack of the pigment in the cones, known as iodopsin may cause colour blindness. Rods are present in ample amount, at the periphery of the retina of an eye. As the name says, these are rod-shaped photoreceptors and supports the vision during dim light or at night. Rods contain a pigment known as rhodopsin or visual purple, it is a purplish pigment, which is rich in vitamin A. This pigment is responsible for the night vision and so rods are said to be sensitive to light, and the visual pigment is black-white. The light level of rods is ‘scotopic’, which means the vision under dim or low light and this type of vision is performed by the rod cells, which are sensitive to the wavelength of approx. 498 nm and are insensitive to wavelengths higher than 640 nm. This effect is known as the Purkinje effect. This is the reason that rods show a slow response to light. Deficiency in the rods may lead to night blindness, that’s the reason that peoples are suggested to consume vitamin A.
Cones are the cone-shaped photoreceptors, though present in less amount than the rods and are found in the centre of the retina. Cones are responsible for the day or bright light vision. But the main feature of the cones is that it enhances in distinguishing the different colours. So on the basis of colour vision, cones are of three types; red, blue and green, cones are less sensitive to light. Cones contain a pigment known as iodopsin, which is the violet coloured pigment, also known as violet vision. The light level of cones is ‘photopic’, which means the vision of the eye under bright light. This condition allows humans and other animals the colour perception and high level of visual acuity. The pigments of the cones are sensitive to the wavelength of approx. 420 nm, 534 nm, and 563 nm and the sensitivity may raise to provide vision over the visible spectrum. The speed of response to light is faster. Deficiency of cones may lead to the colourblindness in humans, and the person will be unable to distinguish among various colours. Rods and Cones are the photoreceptors found in the eye, rods have rod-like structure and provide twilight vision, while cones are of the cone shape, fewer in number and provides the vision in day or bright light. Rods are found around the boundary of the retina, whereas cones are there in centre of the retina. Out of the 125 million photoreceptors, rods are about 120 million in the human eye and cones are 5 million photoreceptors. The outer segment is cylindrical of rods which contain rhodopsin pigment, made up of Vitamin A, while the outer segment is conical of cones which contain iodopsin pigment. Cones provide colour vision, which is of three types: red, blue and gree, whereas rods cells do not give colour vision, they do not have any differentiation. Lack of the rhodopsin in the rods may cause night blindness, while lack of the iodopsin in the cones may cause colour blindness. Rods provide the vision in the dull light (darkness or night), whereas cones are known to give the vision during the day or bright light. Rods and Cones are the photoreceptors of an eye. Both absorb light (photon) at a different wavelength. These are modified nerve cells. The process of phototransduction is same in both the cells. 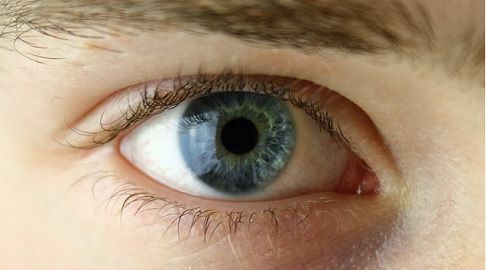 In this content, we came to know about the two major components of an eye, through which we can able to see in bright and dim light and also able to differentiate among different colours. The two photoreceptors cells, have some significant distinction and share some similarities too. However, they work for the same purpose which is the vision.